Part of Tanzania, Zanzibar is an idyllic island situated in the Indian Ocean. White sand, palm trees and turquoise water make for a picturesque holiday destination. Its origin as a trading point means it has a rich cultural mix with a strong Arabic flavor. Zanzibar is well known for its spices and carved wooden doors as well as being the birthplace of Freddie Mercury. Masai warriors, tortoises, beach boys and dolphins all mix together to create a unique tropical spot. Jaws Corner, named after the large painting of a shark face on the wall, is the hangout for Zanzibari locals. They sit around here drinking Arabic coffee and catching up on local news. Jaws corner and the surrounding alleyways are a great place to wander and pick up some tourist knick knacks. The atmosphere is funky and the place is filled with a combination of tourists and locals shopping, drinking coffee and people watching. A painting in Jaw’s corner in Stone Town © Michael Sheridan / Shutterstock, Inc.
Catch a dalladalla, the tradition Tanzanian form of public transport, out to Jozani National Park. Head down the drive to the information hut and get a entry ticket. This will also entitle you to a guide who will take you on a walking tour through the forest. As the guide takes you down the path he shares lots of information about the area. Before you know it you will realize you are surrounded by monkeys hanging from trees above your head. Doing it this way instead of taking a tour will save you a lot of money as the entrance fee for the park is only $8 US. Two red Colobuse Monkey in a rainforest of Jozani Chwaka Bay National Park, Zanzibar, Tanzania © SanderMeertinsPhotography / Shutterstock, Inc. Curious shaggy ape on a tree in Jozani Chwaka Bay National Park, Zanzibar © Tatyana Vyc / Shutterstock, Inc.
Every night of the week the Stonetown waterfront comes alive at the Forodhani Gardens. The smells of barbecuing seafood fill the air and the calls of the street food sellers make for a funky vibe. Wander around and check out what’s on offer before making any decision as there are so many stalls to choose from. Search for the Syrian shawarma maker, he’s often surrounded by a crowd of people because his shwarma are simply the best. Hot, freshly made and delicious. Wash it down with a cup of freshly squeezed sugar cane juice pressed into the cup right before your eyes. Cooks are preparing delicious octopus and offering food to people © Pajac Slovensky / Shutterstock, Inc.
Street food market in Forodhani gardens in Zanzibar Africa © lidialongobardi77 / Shutterstock, Inc. If you are staying near Jambiani a bike is the perfect way to explore the local area. Most of the guest houses can organize hireage for you. Head along the coast and check out the beach, the fisherman and the local villages. Stop along the way for a swim on one of the white sand beaches or take a refreshment break at one of the huts or guest house that are tucked away everywhere. If you get tired legs the dalladalla drivers will let you put your bike on the truck and catch a ride from around twenty cents, if you ask nicely. Zanzibar beach © hakuna_jina / Shutterstock, Inc.
Local children walking on the beach in Jambiani, Zanzibar © Lebelmont / Shutterstock, Inc.
Safari blue is one of the most popular tours offered in Zanzibar. You get to spend the day on a dhow, a traditional wooden boat, sailing on the turquoise waters of the Indian Ocean. The safari takes you out into the conservation area where you get to swim and snorkel with dolphins. If you are lucky you might get to see a turtle swim by as well. Lunch is a tropical picnic on a sandbar before heading back out to explore the local lagoon. Make sure you search around for a good price as everyone will try to sell you Safari Blue. A little girl swimming with pair of dolphins underwater © Willyam Bradberry / Shutterstock, Inc. Turtle in Zanzibar © Willyam Bradberry / Shutterstock, Inc.
Prison Island, also known as Changuu Island, is the home to giant Aldabra tortoises. 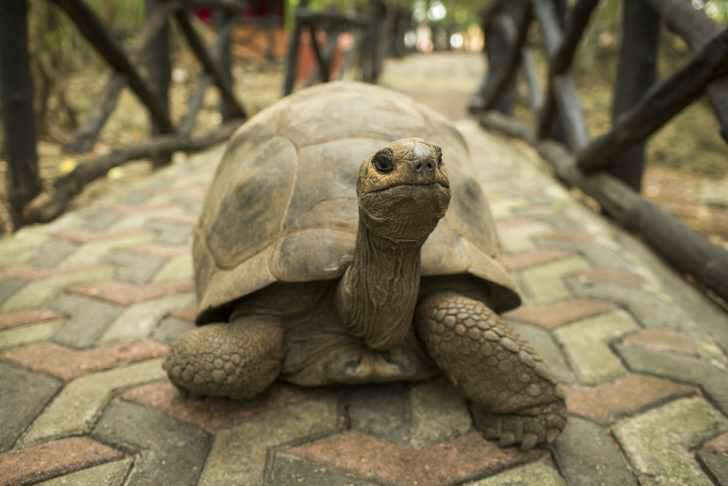 With declining numbers, the island is used as a sanctuary for the tortoises, and tourists that visit can feed them and watch them as they lumber around. The island is a great spot to relax on the beach and work on your tan. There are paths around the island that you can wander, check out some of the forested area or explore the old prison ruins that give the island its name. Prison Island, Zanzibar © margo1778 / Shutterstock, Inc.
A part of beach with wooden mole on Prison island, Zanzibar © Hamady / Shutterstock, Inc.
An Aldabra giant tortoise looks out from its shell on Prison Island off Zanzibar, Tanzania © danm12 / Shutterstock, Inc.
Livingstone Bar is a funky beach front bar that has the best spot to chill out and watch the sunset over the ocean. Grab a cocktail or a beer and enjoy the sounds of the live music. There are tables set on the sand and from there you can chill out and do a little people watching. At dusk the local beach boys practice their acrobatics on the sand, using old tyres as springboards. It makes for a pretty entertaining show for free. They get some incredible air. Young african man doing somersaults on the beach in Stone town, Zanzibar © cdelacy / Shutterstock, Inc.
Fishermen Dhow Boat coming back home at sunset from a long day in the sea © nelik / Shutterstock, Inc. In Kizimkazi, down the end of a dirt road, lies promised land. As you head there you feel like you are on the road to nowhere but trust me it is worth it. Promised land is a guest house and bar that overlooks the Indian Ocean. Grab a drink from the rastafarian bartender and try out of the hammocks or couches that are just begging to be lazed in. If you want a little more action they have beach volleyball and a tightrope too. In the evenings everyone gathers round the fire pit and plays the African drums and sings and chats. Wild paradise beach near Kizimkazi village in Zanzibar. © Authentic travel / Shutterstock, Inc. Sand beach with palm trees, Kizimkazi, Zanzibar, Tanzania © dibrova / Shutterstock, Inc.